We specialize in BulkSMS services, providing easy to use professional tools which allows you to deliver messages securely, reliably and instantly to just about anyone you need to reach, wherever they are and whatever device they're using. Whoever you are, and whatever messaging capabilities you need for your site, system or application to have, KwtSMS can provide it. Why should you choose kwtSMS.com? - NEW: Transfer credits between accounts. - NEW: Detailed SMS delivery reports. - The ability to send SMS to anywhere in the world. - The ability to change the SenderID. - Messages do not have expiration time. - The ability to schedule messages for reminders. - The ability to send Unicode messages (Arabic) longer than 70 characters. - The ability to send unlimited number of messages. 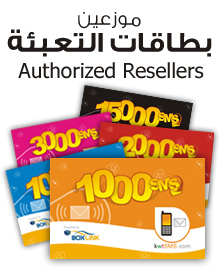 - NEW: Buy SenderID for Kuwait and guaranteed delivery to Zain, Wataniya, Viva. - Register and test the service free of charge. - Very secure system with high privacy and data protection. - Upload and export numbers and manage groups easily. - Recharge your account easily and securely online. - This website is run and managed by an authentic and experienced company since 2003. Register now and try the service for FREE! Copyright © 2018 KwtSMS.Com. All rights reserved.